Sound is measured in units called decibels (dB). Sounds below 75dB are not likely to cause damage that may contribute to hearing loss. However, as the sound increases above 75dB, the risk of it contributing to hearing loss also increases. The risk of developing hearing loss relates to the volume of noise and length of exposure. The degree of hearing loss can be represented by a hearing loss range in dB. Slight to mild hearing loss in adults can be classified by a loss in the range of 16-40dB. Severe and profound hearing loss in adults may be in the range of 71-91dBs, or more. As a general guide, if you need to raise your voice in an environment in order to be heard, then it is potentially noisy enough to cause damage to your hearing. Noise exposure accumulates over a lifetime and every exposure to loud noise contributes to the development of hearing loss. Hearing loss tends to be more common among the elderly, who may have accumulated damage over their lifetime. It is estimated that up to one in three people over 65 years of age are affected by hearing loss. As exposure to excessive loud noise can cause hearing loss, the increased usage of loud personal stereo systems may be causing an increased incidence of hearing loss in the younger population. The outer part of the ear collects soundwaves and directs them down the ear canal towards the tympanic membrane, which is also called the eardrum. The eardrum is a thin membrane that is about 10mm wide and located between the ear canal and the middle ear. The eardrum is very sensitive and slight changes in air pressure cause it to move backwards and forwards. Soundwaves cause the eardrum to vibrate. On the other side of the eardrum is the middle ear. 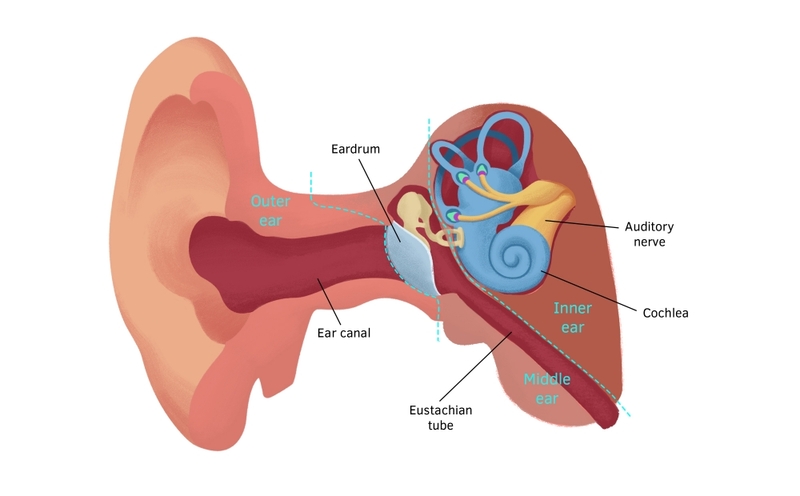 This is made up of a chain of tiny bones, called ossicles, which are connected to the eardrum at one end, and to an opening of the inner ear at the other end. Vibration of the eardrum cause the ossicles to vibrate, which causes movement of fluid within the inner ear. The cochlea is found within the inner ear and its surface is covered with tiny hairs that help to convert the soundwaves into electrical signals that are sent to the brain, via the auditory nerve. Different sounds cause unique patterns of vibrations of these hairs, sending different electrical signals to the brain. The anatomy of an ear. The ear has three distinct anatomical regions – the outer ear, middle ear and inner ear. Hearing loss caused by damage to the outer or middle ear is classified as conductive hearing loss. Hearing loss caused by damage to the inner ear, the auditory nerve or the area of the brain involved with hearing, is classified as sensorineural hearing loss. When both types occur together, it is referred to as mixed hearing loss. The outer ear is made up of the external ear and external auditory canal. Hearing loss caused by changes to the outer ear can include earwax or an outer ear infection. The middle ear is the space between the eardrum and the cochlea. The middle ear contains the ossicles (malleus, incus and stapes). Causes of hearing loss in the middle ear may include a middle ear infection, fluid build-up behind the eardrum, a burst eardrum or stiffening of the ossicles (otosclerosis). Acoustic neuroma, which is a benign tumour of the auditory nerve. Repeat exposure to loud noises, such as those that may occur at building sites or nightclubs. Thinking that others seem to mumble. A feeling of pressure in the ear. Not speaking single words by the age of one year. The physical exam may include having your individual ears covered one at a time, then asking you to repeat certain words, to assess the level of hearing. A tuning fork may be used, which is a metal instrument that produces a sound when struck. The tuning fork is tapped and held in the air on each side of the head to test the ability to hear vibrations travelling through the air. It is then tapped and placed against the bone behind the ear to test for vibrations travelling through the bone. The differences between vibrations travelling through the air and bone can help your doctor identify if you have conductive or sensorineural hearing loss. An audiologist (a healthcare professional specialising in hearing and balance disorders) may use an audiometer to formally assess your hearing and identify the severity of hearing loss. During this testing, the audiometer produces different sounds at various frequencies and volumes and you listen to these sounds through headphones and respond when you hear them by pressing a button. There are other hearing tests that can be performed based upon the patients age and language skills. If a tumour or fracture is suspected, the diagnosis may also include imaging such as computerised tomography (CT) scans or magnetic resonance imaging (MRI). A low-sodium diet, diuretics and corticosteroids for Meniere’s disease. Television and radio listening systems to make it easier to listen without being disturbed by background noise. Include hand and body gestures to aid communication. Difficulty finding and maintaining ongoing employment. Most cases of hearing loss show improvement once the underlying cause is identified and treated. However, since the most common cause is ageing, hearing loss can often be a progressive condition. In some people, effective devices and aids can offer a much improved quality of life. Early assessment for babies at high risk, such as those with meningitis.